A pioneer of direct-drive pick & place and multiple-axis modules, industry leading specialist for rotary tables and automation, WEISS (Buchen, Germany), and its subsidiary WEISS North America, Inc. (Willoughby, OH), recently completed two chassis systems featuring a unique, octagon-shaped, 45.68” diameter dial plate. The plate footprint was properly sized to match the WEISS’ eight station TC220 rotary index table, and was customized to achieve ergonomic, inertia loading, and index speed requirements for a next-generation medical parts subassembly operation for Jerit Automation, Inc. (Mesa, AZ). With over 18 years of experience manufacturing proprietary and custom automated machinery in the Robotics and Automated Machinery Industry, Jerit has built a reputation as a “one-stop” manufacturer. 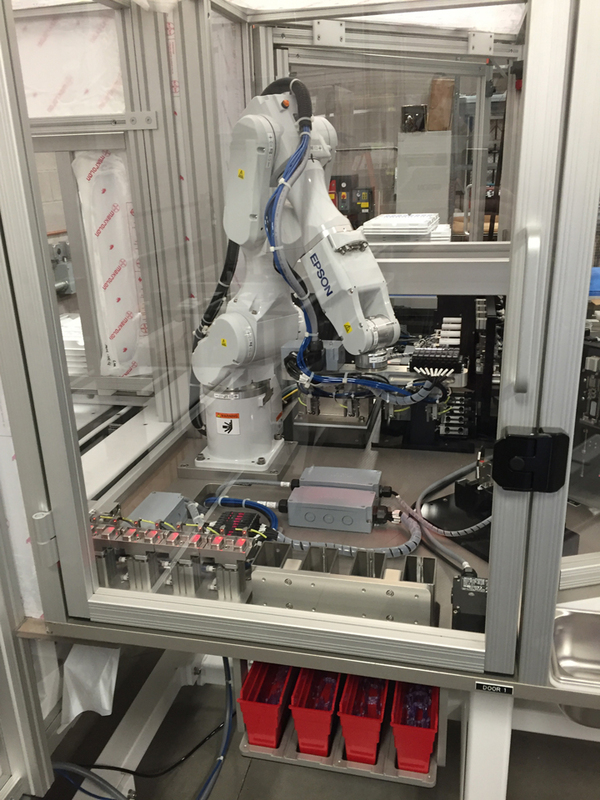 The demands of the palletizing application chassis system involved two robots−which required more space for the operators to work within it. This compelled Jerit to go “outside-thebox” in seeking out WEISS to collaborate on designing the value-added octagonal dial plate system. ▪ Operator 1 loads part A, then part A is clamped. ▪ Dial indexes...Operator 2 loads part B. ▪ Dial indexes...Parts A and B are adjusted to assembly position in pallet. ▪ Dial Indexes...Glue applied by Scara Robot. ▪ Dial Indexes...Camera inspection of assemblies for PASS/FAIL. ▪ Dial Indexes...Parts Pick and Placed with 6 Axis Robot. ▪ Dial continues indexing back to Operator 1. Now in its 3rd generation, WEISS’ TC220 series heavy duty rotary indexing tables feature a robust design combined with impressively fast switching. They also deliver a smooth, jerk and impact-free running and an extremely long service life. Using this stalwart rotary table as the heart of the system, WEISS took the project manager out of the equation for Jerit in designing the frame, oversized table plate, and its associated machining. The frame work and large top plates were designed by Jerit to support all their automation devices for their specific application. Weiss manufactured the units and shipped them completed. ▪ There are two frames that make up a single chassis. - Frame one supports the Weiss index table and rotating tool plate. - Frame two supports some automation for loading/unloading stations. - The two frames connect to each other for alignment reasons. ▪ The top plates are machined from aluminum cast tool and jig plate. - Frame one top plate = 1.00” thick x 84.65” x 89.25” with a hard coat anodize finish. - Frame two top plate = ¾” thick x 26” x 118” long with a hard coat anodize finish. ▪ The tool plate is machined from aluminum cast tool and jig plate. - The tool plate is roughly 45.68” in diameter and features a modified octagon shape. 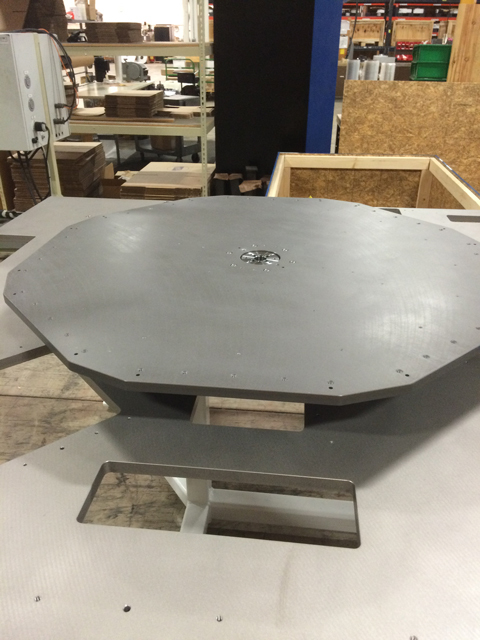 Different than typical round tool plates, this was designed by Jerit to achieve ergonomic efficiencies. - The tool plate is ¾” thick w/hard coat anodized finish. According to Jerit’s President, Jerry Terlaan,“We normally would do these operations in-house, but WEISS provided a one-stop-shop that saved us time on project management. 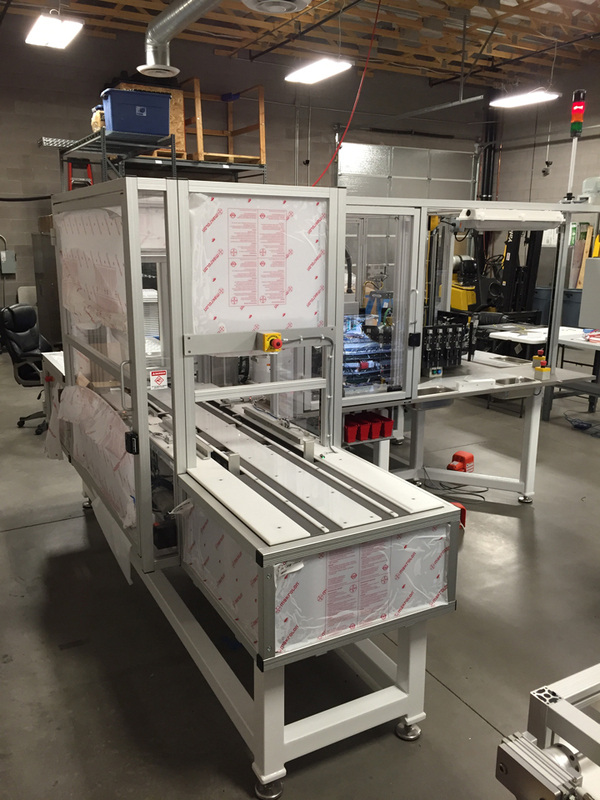 We recently completed the system’s final FAT (Factory Accepted Test) and are ready for shipping. We’ll use WEISS again for future units." An integral part of the Weiss global network, Weiss North America (ISO-9001 Certified) leverages over 45 years of reliable world-wide expertise to comprise an integrative, customerspecific approach to its vast array of electromechanical products. Our 100% vertical range of manufacturing ranges from rotary indexing tables, handling systems, and linear assembly systems−providing flexible technology for turnkey solutions that incorporate electronics, mechanical systems, software, and comprehensive engineering support. This enables us to provide pre-installed, intelligent, and highly convenient solutions for the entire field of kinematics.